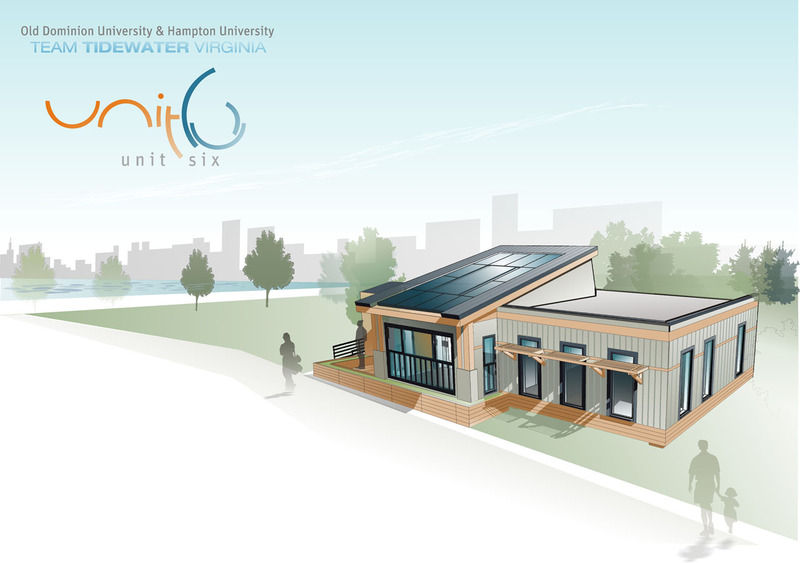 Many Solar Decathlon entries make futuristic propositions for green living, but the Tidewater Virginia team chose to design their house by using a familiar language. Their target market is the Tidewater region of southeastern Virginia, specifically the dense, middle-class neighborhoods of Norfolk, home to many military families. Designed as urban infill, Unit 6 Unplugged draws inspiration from its Arts and Crafts context and provides an affordable housing option for a working couple. 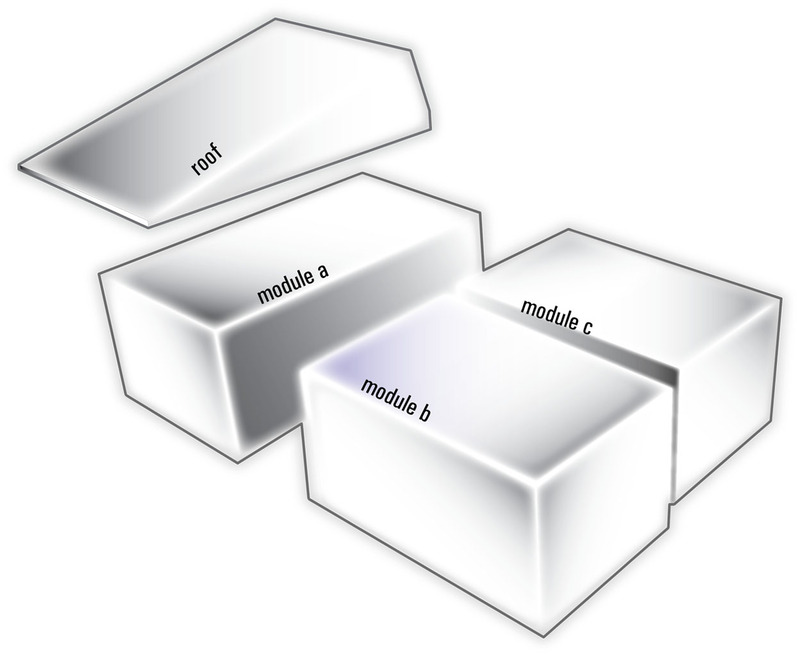 Unit 6 Unplugged is comprised of four modules. 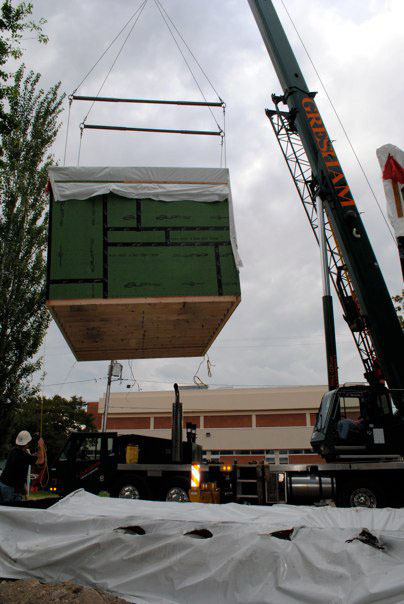 Module A contains a sunroom, kitchen, and all plumbing elements; Module B serves as the bedroom; Module C functions as the living room; and Module D is a sloped roof that will contain solar panels and thermal collectors. 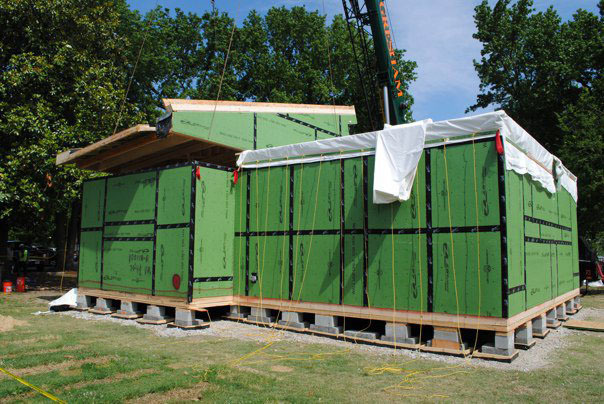 The exterior walls will be constructed with the Zip System, a structural panel product with built-in overlays, eliminating the need for housewrap. 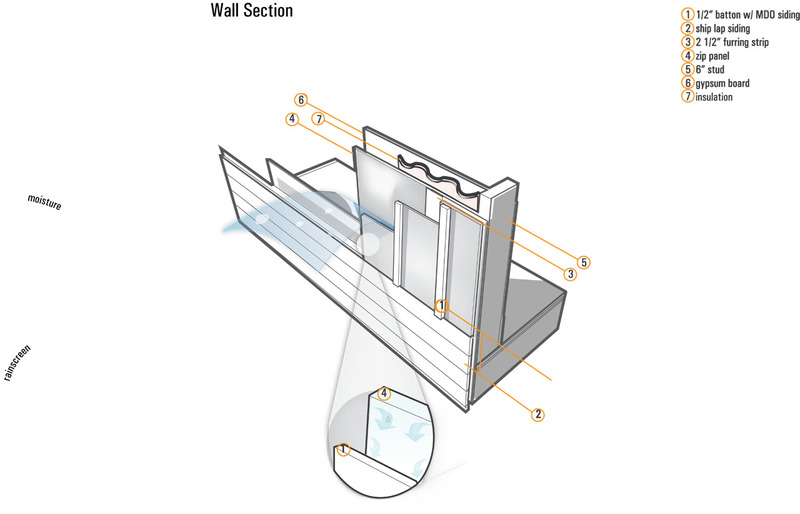 The home will be clad with exterior-grade plywood, which functions as a rain screen. Wood battens and trim will camouflage the seams in a nod to the siding used for the mid-century homes in the neighborhood. Unit 6 Unplugged features an enclosed porch or sunroom, also characteristic of the homes in the area, that actively engages street life. Students designed the space so that it can be used nearly year-round. 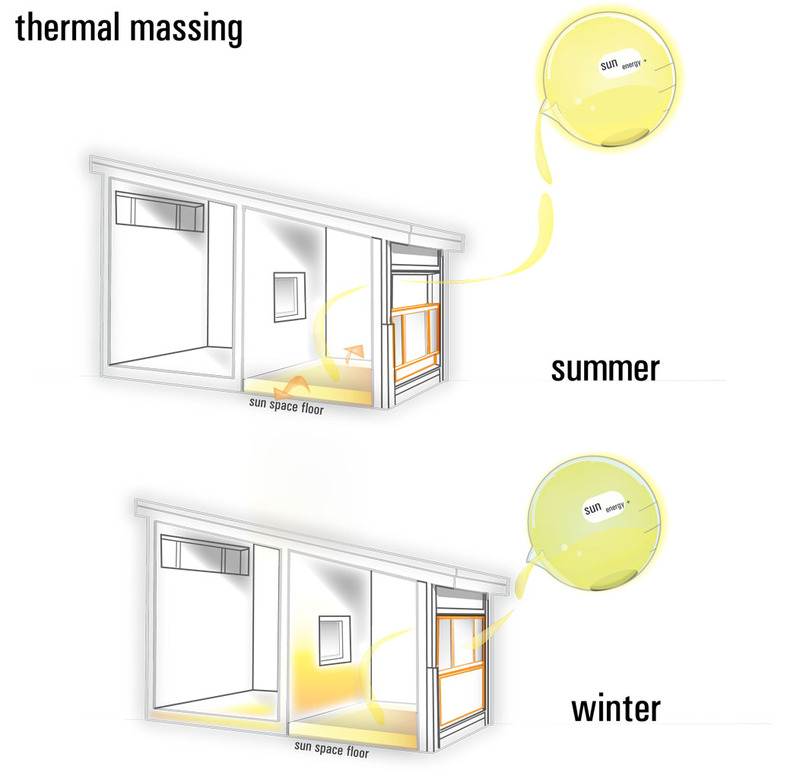 In warm months occupants can open a large, 12’ wide by 7’ tall window; in colder months, an interior window allows the space to passively heat the home, because the tile-covered concrete floor will function as a thermal mass. Located off the sunroom is the kitchen, which receives natural lighting and ventilation through operable clerestory windows. The living room contains large, operable south-facing windows fitted with exterior shading devices. Smaller windows in the bedroom minimize heat gain or loss, and positioned adjacent to this space is a small work area. According to Noel Harrison, the team’s Public Relations Officer and an M. Arch. student at Hampton University, interior finishes include modern bamboo flooring along with more traditional elements like built-in wood casework and base molding and picture rail molding, fitting with the Arts and Crafts precedent. The Tidewater Virginia team took the same low-key approach to engineering systems, sticking with “low-maintenance, reliable, and cost-effective components,” according to Whitelaw, thus avoiding overly complex technologies and instead focusing on passive design strategies. 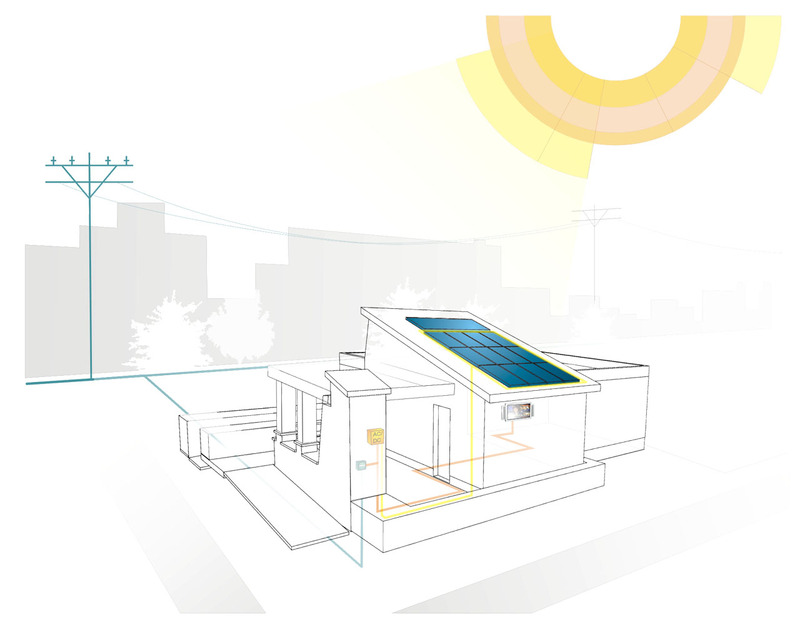 Although solar panels and a solar hot water system were necessary to provide some power, the team neatly consolidated these mechanical systems within a “utility core.” The small exterior closet is located at the edge of a deck and bridged by a pergola. 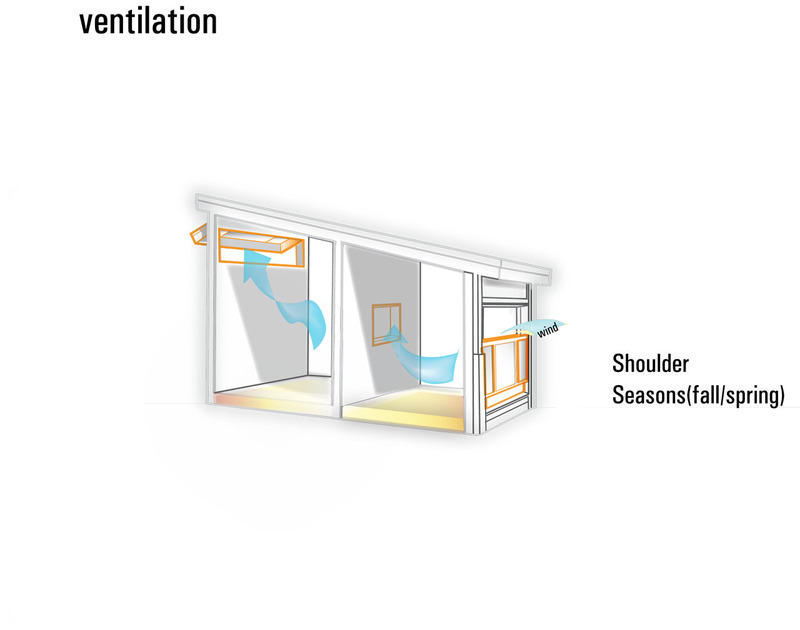 By situating these elements outside, the team was able to minimize the length of electrical lines, allow for easy maintenance, and eliminate the transfer of noise and heat to interior spaces. 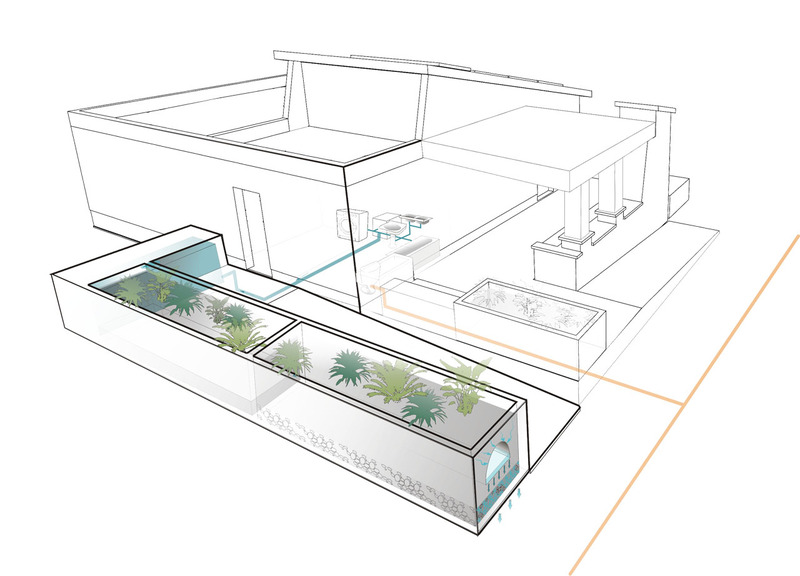 When the unit is adapted as a multiple-dwelling complex, the utility core will allow the city to meter electrical usage rates individually. 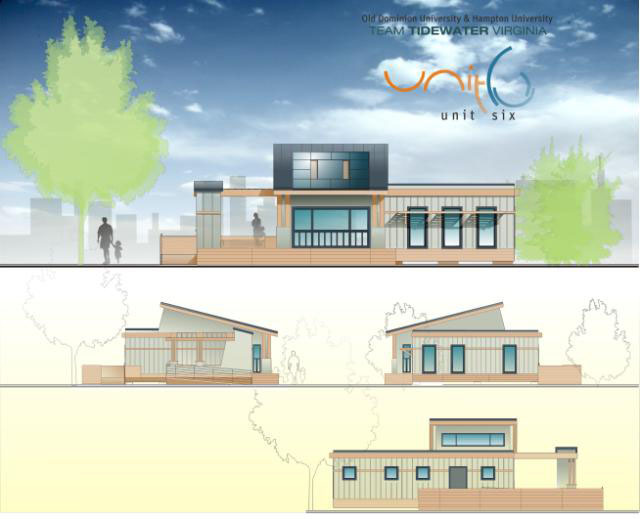 The marketability of Unit 6 Unplugged is a priority for team members, because “sustainable design isn’t very sustainable if only a few people can use it,” explains Whitelaw. To further increase the home’s appeal beyond aesthetics, team members have worked to ensure that their home remains affordable. 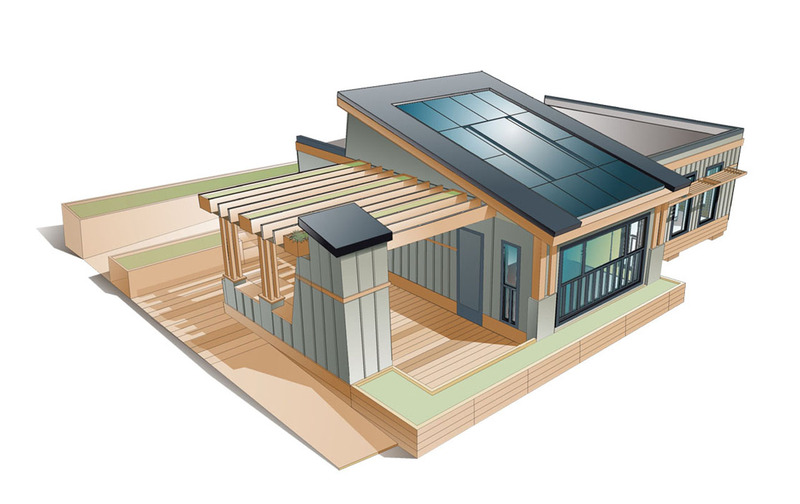 The estimated construction cost of the unit is under $250,000, qualifying for points in the Solar Decathlon’s newly created Affordability category. 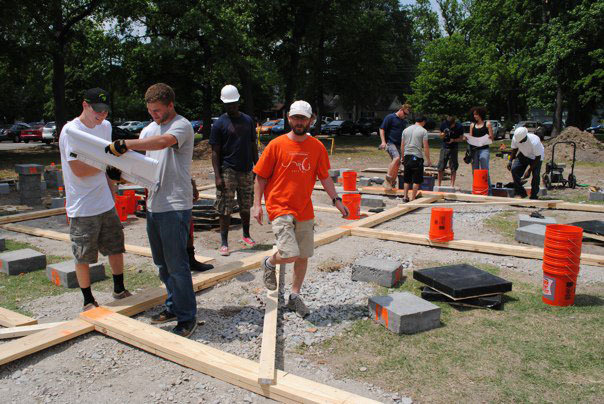 In January, the Tidewater Virginia team members, along with many other Solar Decathlon teams, attended the National Association of Home Builders (NAHB) International Builders Show (IBS) in Orlando, Florida. 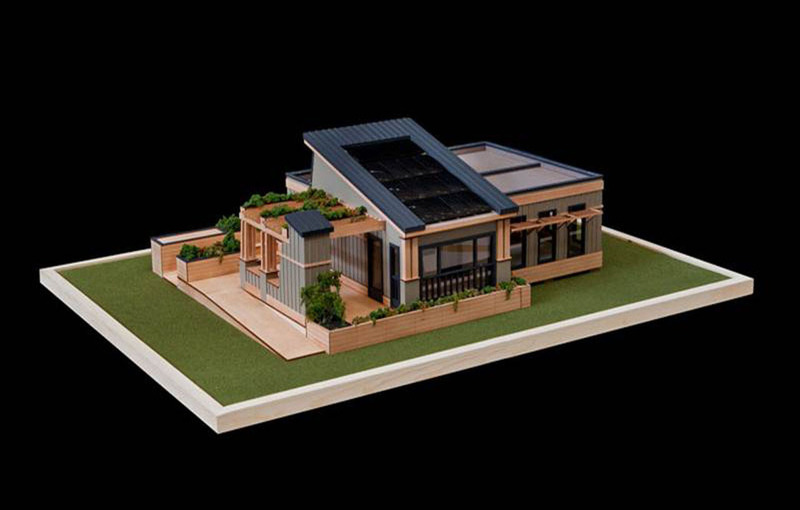 They presented a model of the home and it instantly became one of the crowd’s favorites. When it comes to market appeal, “we’ve got that part of the competition in the bag,” Harrison believes. Either way, the multi-unit version is soon to become a reality: land is available and a developer has expressed interest in building several versions of the project in Norfolk.